In the film, “Pooh’s Grand Adventure: The Search for Christopher Robin,” Pooh and Christopher Robin, who are the closest of friends, have a moving conversation high in a tree where strength and love flow heart-to-heart as a beautiful words are spoken. Pooh: "Oh, that's easy. We're braver than a bee, and, uh, longer than a tree, and taller than a goose... or, uh, was that a moose?" On the night before his death, Jesus had a long conversation with his closest friends, his disciples. Though we can’t watch it on a movie, you and I, through the audio recordings of the divinely breathed Word, are able to eves drop on the intimate dialog that was recorded in the New Testament book of John, chapters 13-17. I imagine the minutes were a blur that evening as Jesus sifted through the emotions of all that was to come. He knew that within hours, one would betray him, another would disown him, and all would make haste to separate themselves from him in his most excruciating earthly moments. Yet, beyond the burden of his own pain, Jesus humbled himself to serve those he loved by washing filthy, calloused feet. Then Jesus had a moving conversation in an upper room and in a vineyard where strength and love flowed heart-to-heart as beautiful words of life were spoken to his cherished friends. May these red-letter treasures serve as a reminder to you today that you are not alone or ill equipped for the challenges in your life. Take heart! You are braver than you believe, stronger than you seem, and smarter than you think because the Spirit of God is at work within you to embolden, strengthen, and guide you. Above all, remember this: he will always be with you. He will always be with you. He will always be with you. We really need to learn to trust God, and that can sometimes be hard. Need help? 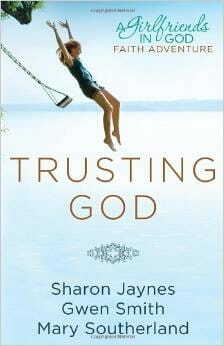 Order a copy of our GiG book, Trusting God. Click here to get the book from Amazon.